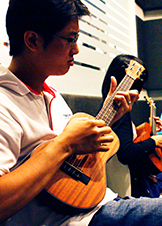 Contemporary Ukulele Program™ Level III is geared to spur you to greater heights on the ukulele. Build on the chord forms, now firmly rooted in your muscle memory, by playing with alternate voicings to freshen up any song. The introduction of fingerpicking offers an added rhythm option for ensemble setups and promises to brew a genuinely rich blend of rhythm and harmony. Experience first-hand the joys and excitement of creating new sounds and flavors on the ukulele! Theme: THE STORY OF MANKIND: Faiths explores the impact of religious ideology through the era of the Middle Ages. Connect the dots to understand the religious undercurrents that still affect humanity today. All Training Rooms are fully equipped with practice guitars. Our Training Centres are conveniently located at either International Plaza - Flagship (beside Tanjong Pagar MRT station), Tampines Plaza (right across Tampines Bus Interchange) or One Commonwealth (beside Commonwealth MRT station).